Early on the morning of April 3, 1940, the long history of the Dryfus Packing & Provision Co. came to an end when fire destroyed the building. The founders of the business, Leopold and Ferdinand Dryfus were no longer living at this time. Leopold had passed away in 1917; his brother, Ferdinand had operated the business until his death in 1936. Leopold was born in the Rhine Country of Bavaria on July 31, 1847, the oldest of ten children. At the age of twelve he began his business career by purchasing and trafficking in calves. He soon became an expert judge of livestock. 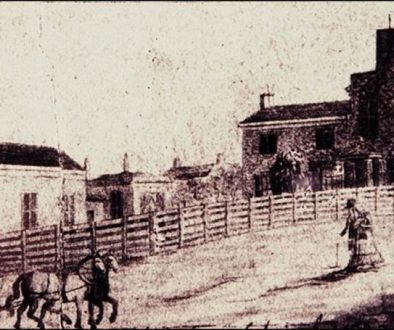 In 1866, when he was nineteen, Leopold came to Lafayette with the assistance of his uncle, Jacob Mayer, who sent money to help defray the cost of the trip. Jacob also established Leopold in the butcher business. 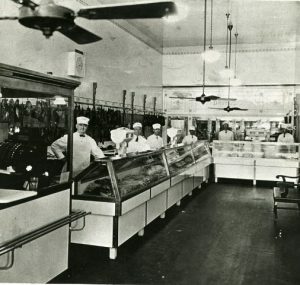 Leopold worked for his uncle until 1870, when he was given his own butcher shop at the corner of Ninth and Union Streets (111 North Ninth) to manage. Leopold eventually purchased the business and formed a partnership with Charles W. Kurtz; the business was called Dryfus and Kurtz. In 1872, Dryfus bought out Kurtz and sold half to James Sharp. This partnership lasted until 1887, at which time Leopold’s brother Ferdinand purchased Mr. Sharp’s interest. 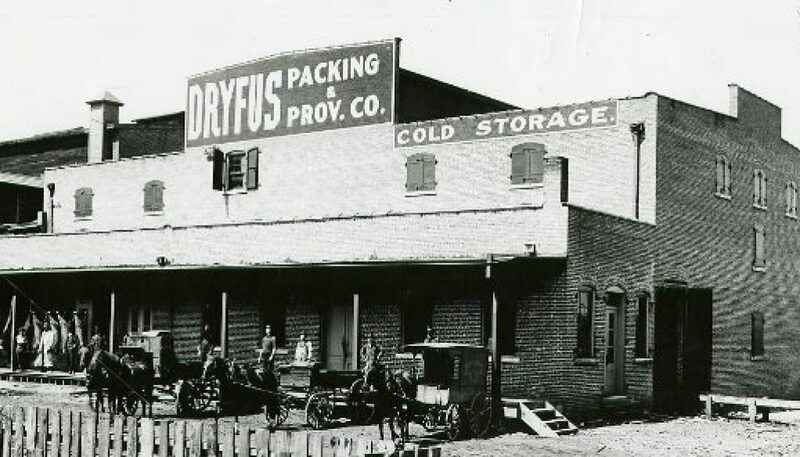 The business was renamed Dryfus Packing & Provision Co., and soon became the largest of its kind in northern Indiana. Leopold entered the provision business in 1876, when he joined William Horn & Co. He dissolved his partnership with Horn in 1879 and bought out the packinghouse of Henry T. Sample & Sons. This packing house would become the home of Dryfus Packing & Provision Co. When the fire destroyed the company in 1940, part of it was the 1850 structure built by Sample. By 1909, the Dryfus Packing & Provision Co. had the capacity to process 300 hogs per day, plus cattle, sheep and other meat animals. The company employed 100 men constantly; eventually there were 160 men on the payroll. The facility was modern and up to date, having two ice machines and nine cooling rooms. Four salesmen were on the road, and the company shipped to various parts of the United States and abroad. They also had many long-time customers locally. Leopold was a community leader. He was a stockholder in Merchants National Bank and the Lafayette Telephone Company, and served as a director for both companies. 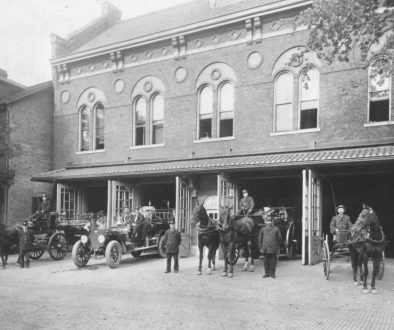 He owned a 163-acre farm near Purdue University, and the Ewry Block on Columbia Street. His home was at Sixth and Cincinnati Streets. 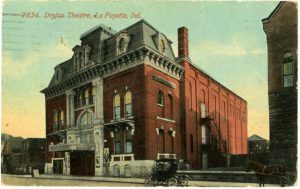 He purchased the Grand Theatre in 1909, and had it gutted and remodeled, and renamed the Dryfus Theatre. It was destroyed by fire in 1914. Leopold Dryfus died on November 20, 1917. His obituary said he was well liked and that he had enjoyed working the counter at the Main Street meat market. His bother Ferdinand continued to operate the business until his death on January 10, 1936. That same year the Dryfus Packing & Provision Co. declared bankruptcy.